I would highly recommend These photo album pages. I have been using these pages for more then 20 yrs. My photos look great. Kind of expensive, but worth it. I use these for all of my photos. Just wish they would make a size to fit the popular photo greeting cards. The sleeves are great quality and easy to handle. The opacity of them makes viewing easy. I have no negative comments about this product. I use it for many years and I am planing to use it for many more years to keep my photos preserved and organized. It is great for looking fast through the Album for reference materials for making artwork or paintings. It keeps the photos preserved and clean. Great quality product! I only buy these photo pages because of their quality. This product is much more sustantial than single weight. It is certainly worth the extra money. Best place to get my needs. Good products and fast shipping. I like these pages due to their quality construction. When I have received or inadvertently bought the lighter version, I have been disappointed. These are the only pages I trust. Also like that they hold horizontal and vertical shots. Perfect high quality for the Presidential albums I have been buying for years. love the quality and long-term value! I have been buying these photo pages for a decade or more. They are a nice weight, long-lasting and don't yellow or degrade, excellent quality and a real value over the years. i purchased 10 albums and about 15 packages of the 3x3 photo album sheets. i believe that out of those, 4 were this particular page. i should have purchased more of them and plan to. so many photos from the 90's were this size and i'm reorganizing my photos. 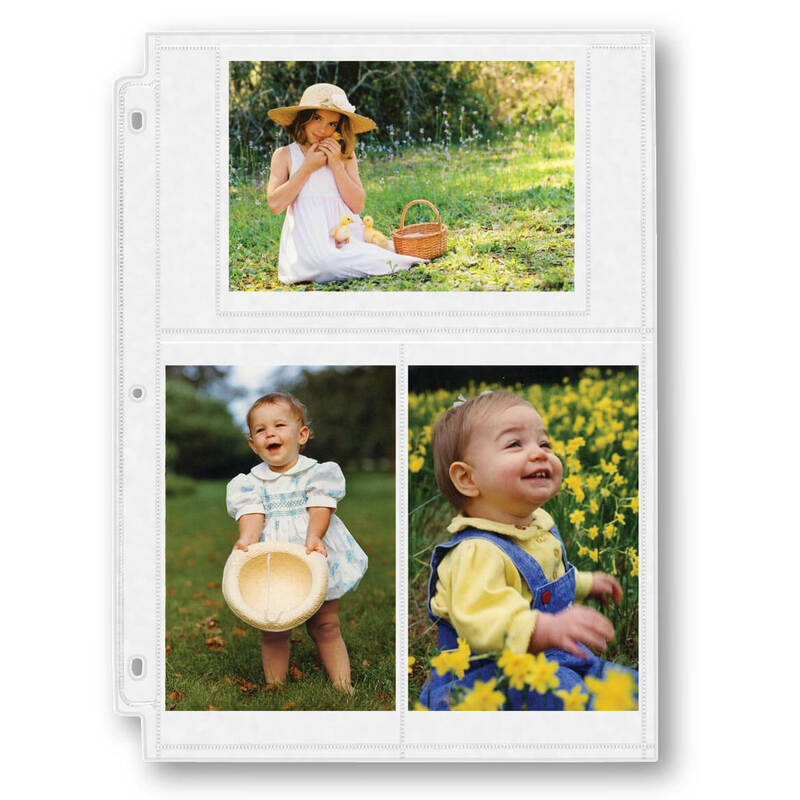 these are great sturdy sheets and easily fit two photos in each slot with little effort. plus, they aren't sticky, so they won't ruin your photos. Everytime we go on vacation I order a new supply. Then when we get home, I can organize our photos & share them. I like these pages much more than the single weight pages that tear more easily. I like the Presidential albums and have been buying them for years. My view is that since the albums are expensive it does not make sense to go cheap on the pages. I keep track of the cakes I've decorated. Great way to show my work to perspective brides. Good variety of pockets for various sized photos. Great service from Exposures. I have been preserving my 4x6 (and 5x7) photos for many years. I have ordered these twice and both times they have been wavy. Since my photos are new and flat, they soon take on the waviness of the plastic sheet. (The sheet does NOT become any less wavy.) For someone who is as protective of his/her photos as I am, I would NOT recommend using these. I have been able to order from other retailers - and have received quality 4x6 (or 5x7) sheet preservers which are perfectly flat.